Gumdrops are the U.K.’s answer to keeping chewing gum off its streets. 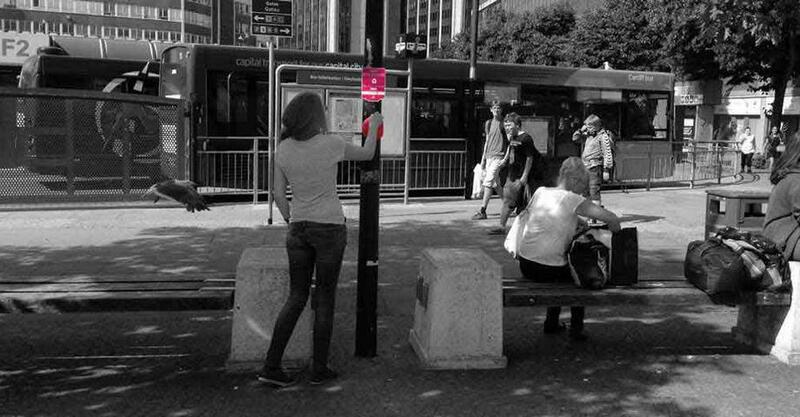 What Are These Hot Pink Globes Popping Up Around London? What are those hot pink bubbles on the streets of London? What’s That Thing is Slate’s column that examines the details of the world that are hiding in plain sight. Send ideas for future columns, along with photos if possible, to whatisthat@markvr.com. The last few months I’ve been seeing odd little pink globes popping up on signposts and lampposts around London. I finally walked up to one to investigate. These bins are called Gumdrops. 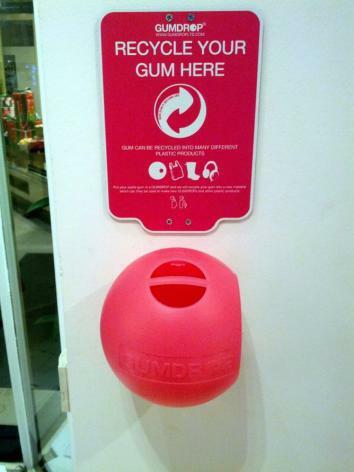 Designed to resemble strawberry-flavored bubble gum bubbles, Gumdrops are recycling bins for used chewing gum. That’s nasty, I thought, but Britons seem cool with them: The first Gumdrop I saw (at an airport) was bursting with a moist, mostly gray, brain-sized amalgamation of well-chewed chewing gum. I haven’t chewed gum since eighth grade, when a girl named Tracy swore that if I accidentally swallowed a piece it would lodge in my digestive tract for seven years (a myth debunked by Scientific American, which nevertheless confirmed that gum is “largely indigestible”). Still, I often find gum lodged in other distressing places, like the treads of my sneakers; the undersides of tables; or as dark splodges on urban sidewalks, roads, and train platforms. By one estimate, we spend 187 billion hours chewing through 560,000 tons of gum every year. Indeed, given how much gum we chew, it’s surprising that we don’t encounter more gum that hasn’t been disposed of properly. Recycling some of that used gum seems like a neat solution to a number of messy problems. I was relieved to discover that the gum that’s collected in Gumdrops doesn’t actually get turned into new chewing gum. When the Gumdrop is full, it’s sent back to the company (via UPS’s carbon-neutral shipping service), where the recycled gum is then processed and used to make more Gumdrops, which are subsequently deployed to collect more gum. Clever, huh? 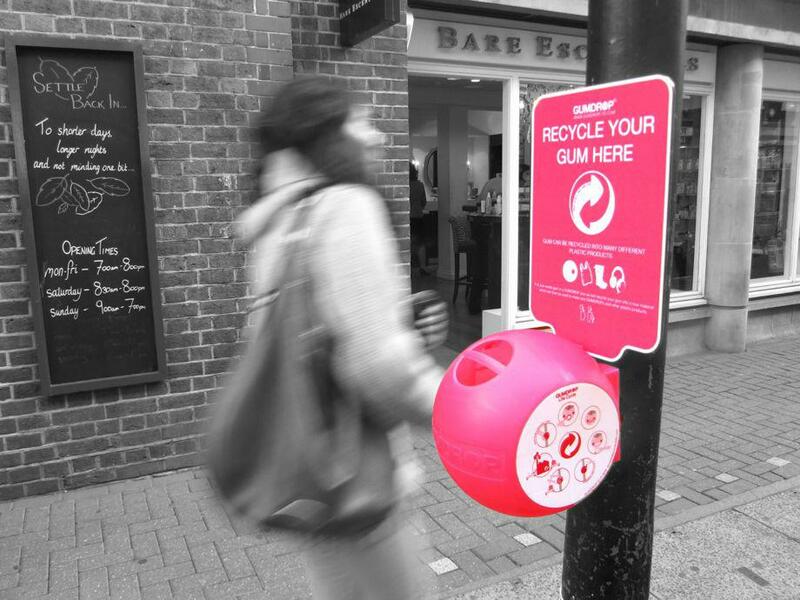 According to Anna Bullus, the gum-chewing British product designer who founded Gumdrop in 2008, the program is the world’s first “closed loop” recycling system for chewing gum. In early field trials, Bullus and her colleagues installed Gumdrops in public venues and gathered data on which locations collected the most gum, how often Gumdrops needed to be replaced, and which demographics were most likely to use them. In a trial at Southampton Airport, two Gumdrops were placed in a men’s restroom and were changed five times over a year at a cost of about $340 for 10 Gumdrops—but saved an estimated $4,620 in cleaning costs. 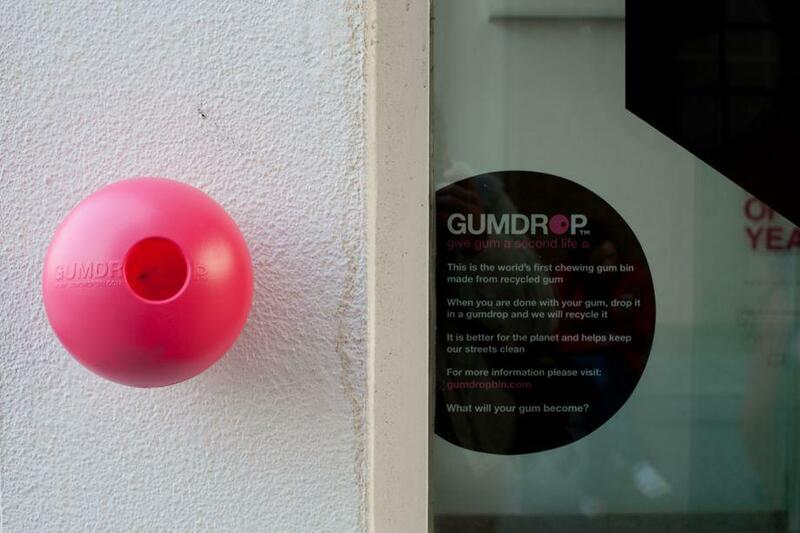 Another Gumdrop trial reduced the gum litter on London’s busy Villiers Street by 40 percent. That’s quite something, given that a complete de-gumming of Oxford Street, less than 2 miles long, requires three months of steam-cleaning and typically removes more than 300,000 pieces of gum. Bullus says that although public acceptance wasn’t a major issue, coping with what actually ends up in a Gumdrop was. For starters, different gums have different formulations. Then there’s everything else that people mistakenly stuff into Gumdrops, including cigarette butts, coins, and hair. Bullus wouldn’t divulge how her company copes with such indignities but says it can handle just about anything that might be crammed into a Gumdrop. 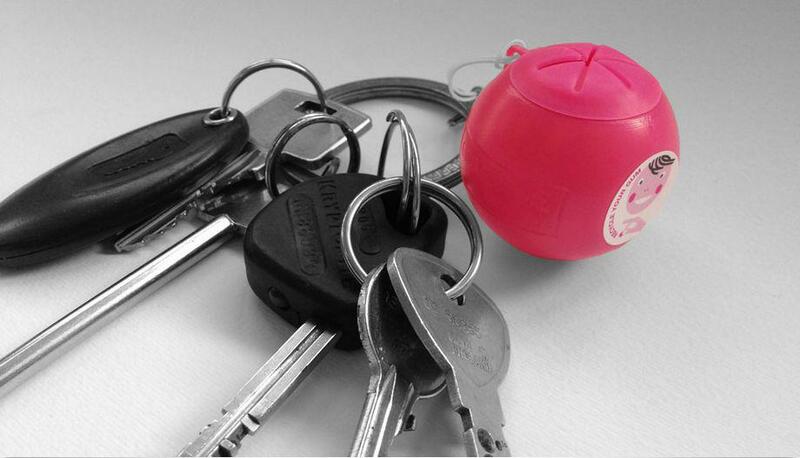 The company has also created Gumdrop On-the-Go, a mini gum-recycling bin on a keychain for personal use. Gumdrop landed its first commercial contract in 2012 with Legoland, the popular theme park west of London. Since then, Gumdrops have caught on with more British property owners and government authorities, for whom cleaning up discarded gum is an expensive and Sisyphean irritation. The firm has just started expanding into continental Europe, and Bullus hopes Gumdrops will soon arrive in the United States. America would be a prime target: About 59 percent of Americans chew gum. Although that’s more than the U.K. (44 percent), we lag behind Saudi Arabia (79 percent) and Iran (82 percent). The only place that isn’t likely to be on Gumdrop’s radar? Singapore, where the government’s war on chewing gum is famous, the sidewalks are spotless, and the soles of your shoes have been quite safe for years. See something that you’re wondering about, at home or abroad? Send a pic and description to whatisthat@markvr.com. More on Slate: How Green Is My Wintergreen?